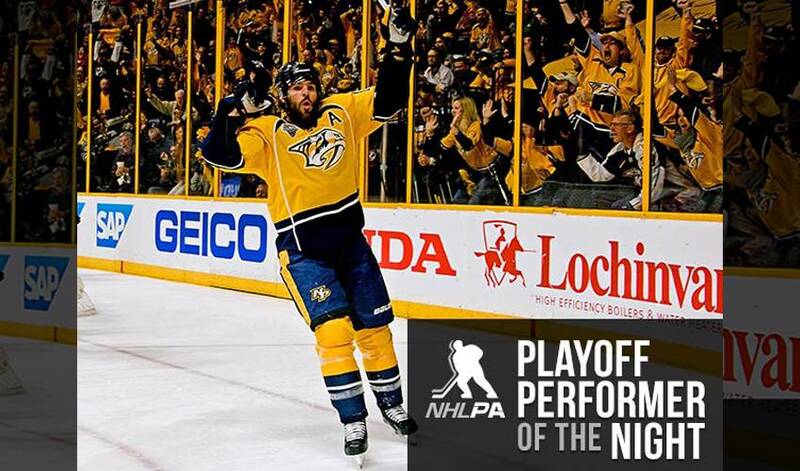 Mike Fisher is the PPOTN after his triple OT goal gave Nashville a 4-3 win over San Jose and knotted the series after four games. The veteran forward, who recently reached a major career milestone, had a pair of tallies in the marathon contest. STAT PACK: Fisher scored twice, was a plus-3, took five shots, blocked four, recorded five hits, and took a whopping 55 shifts in 37:33 of ice time. GRATEFUL HE’S ON OUR SIDE: “It took a long time, but thanks we have Fish,” said Nashville goaltender Pekka Rinne. A (HOME) FIRST FOR MIKE AND CO.: The Predators, who tied the game with 4:21 remaining in regulation, improved to 3-7 in all-time playoff overtime games and earned their first such victory on home ice (1-3). Half of their postseason overtimes games have required multiple extra frames, including each of their past three (0-2 vs. Chicago in 2015 first round). EXTRA EFFORT: Fisher, who has one other multi-goal game in the postseason (Game 1 of 2011 Conference Quarterfinals at Anaheim), registered his second career playoff overtime goal (also Game 6 of 2004 Conference Quarterfinals vs. Toronto, with Ottawa). A GRAND CAREER: Fisher reached the 1,000-games plateau on March 3, 2016, in a home game that saw Nashville host New Jersey. HONOURABLE MENTIONS: Cody Eakin netted the OT winner as Dallas evened their Western Conference series against St. Louis. Jamie Benn had two assists for the Stars, while Patrick Sharp contributed a goal and an assist. Vladimir Tarsenko had one goal and a helper for the Blues. Pekka Rinne made 44 stops for the Predators. Colin Wilson had a tally and two assists in the victory.